Narrow-leaved ipomoea, Windhoek Botanic Gardens. Breakfast was at 7am and we were away just after 8am, to take advantage of the relative cool of the morning. We then took the short drive to Windhoek Botanic Gardens where we were greeted by some 150 little swifts circling and calling around us. We saw their mud nests on the buildings once we were inside. Little swifts buzz over Windhoek Botanic Gardens. After a covered area with drought-loving succulents the wide paths took us around helpfully labelled shrubs and trees, though most had little more than a few leaves showing. There were two types of skinks, variegated and striped, and a low rocky outcrop had a pair of rock agamas displaying, the orange-headed and orange-tailed male doing press-ups to impress the female. Scarlet-chested sunbird and diderick cuckoo were nice finds for some of the group, some saw rosy-faced lovebird, Gill saw a rock hyrax and red-headed finch was probably a new bird for everyone. The showiest butterfly seems to be a good match for wandering donkey acraea; an orange-tip may have been speckled sulphur tip and the underwing pattern showed well on a brown-veined white. 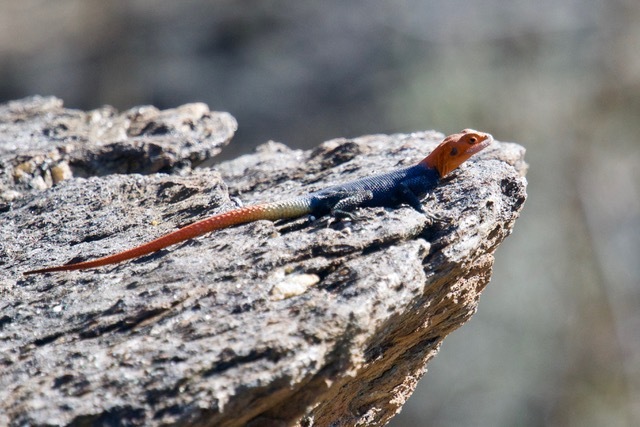 Male rock agama, Windhoek Botanic Gardens (Tim Hunt). The rest of the morning and past noon was taken up with the long drive to Waterberg NP. The roads were good through mostly rather featureless thorn scrub, punctuated with termite mounds in the latter half. Not far from our destination we stopped under the shade of an acacia for a picnic lunch – southern yellow hornbill was new here – before we finished the last part of the journey on a dirt road. There were two marico flycatchers by the gate into the Waterberg complex and a nicely tame Burchell’s glossy starling was enjoying the watered lawns near reception where Geoff collected keys. We drove to the higher part of the site to find our chalets, spread out under the long sandstone cliffs. A little sparrowhawk dashed through before we split up and Geoff gave us a warning about the house-breaking abilities of the party of baboons at home in the area. Red-billed spurfowl: common at Waterberg (Tim Hunt). 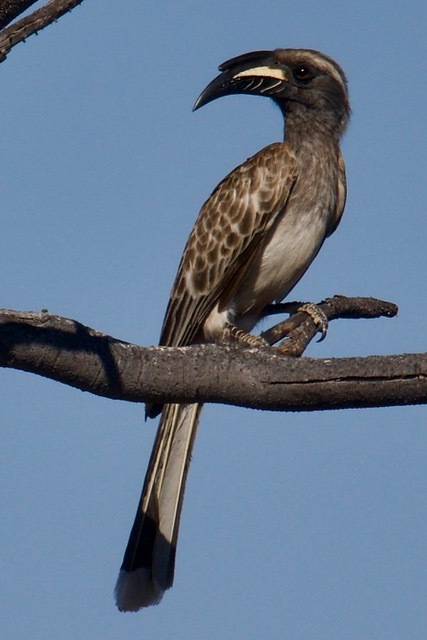 African grey hornbill (Tim Hunt). After settling in and a break, most of us reconvened at 4pm for a gentle stroll in the chalet area. 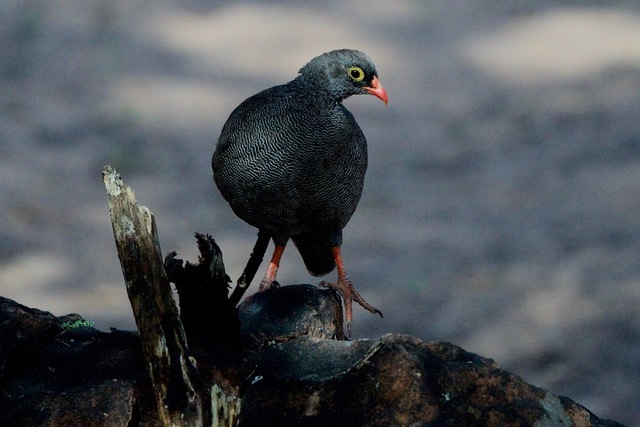 Red-billed spurfowls fed on the grass and an African grey hornbill was a new bird. Two Verraux’s eagles drifted through towards the cliff; a buzzing song alerted Geoff to a white-bellied sunbird high on a bare tree. There were groundscraper thrushes on a different patch of grass, like a short-tailed mistle thrush. On the drier ground around the buildings and under the trees was a big group of little birds. Most were green-winged pytilias (formerly melba finch), pretty enough in their own right but among them were two stunning male violet-eared waxbills, with blue waxbills for good measure. A couple of grey go-away-birds were dust-bathing as we walked back to where we’d come from, and then banded mongooses moved to and fro in the roadside vegetation. 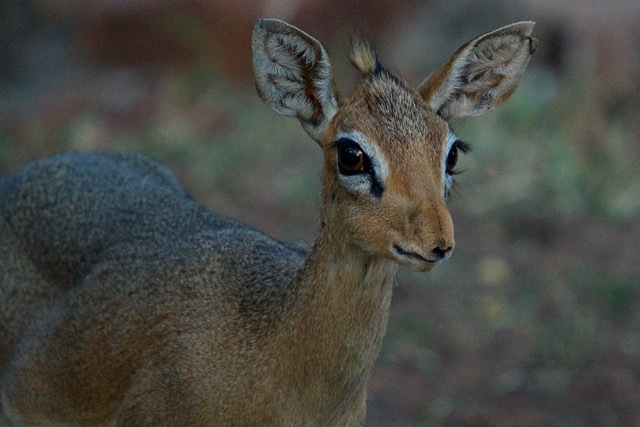 Later they emerged, 14 of them, on the grass by the chalets where they mingled with Damara dik-diks. We walked to the dining room, a converted hospital, past the swimming pool where earlier Daphne had swum and seen a snake. Checklists with a drink then dinner were followed by walking back up the hill with Darrin, armed with torches. A bat was hanging in a bare tree, then more flying around. A pearl-spotted owlet was calling and a lucky few saw some bushbabies scampering through the trees.